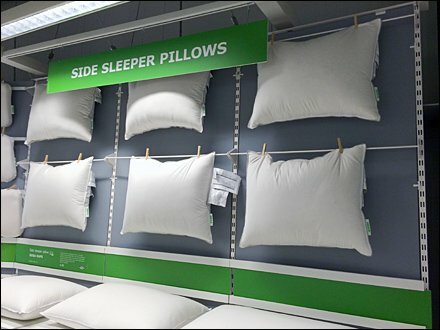 This IKEA Clothes-Pinned Pillow Merchandising low-cost but highly shopable solution to individual pillow display and sales. Just clothes pin pillows to wireform bar merchandisers and position backstock for selection below. Green signs and departmental brand racing stripe optional, but very nice touches as always by IKEA in-store. 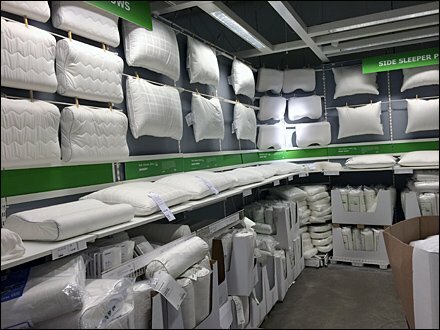 CLICK the thumbnail for a close view of an IKEA Clothes-Pinned Pillow Merchandising grouping.